I just can’t seem to get enough pumpkin! The recipe for today is a Martha Stewart recipe that you can find here. 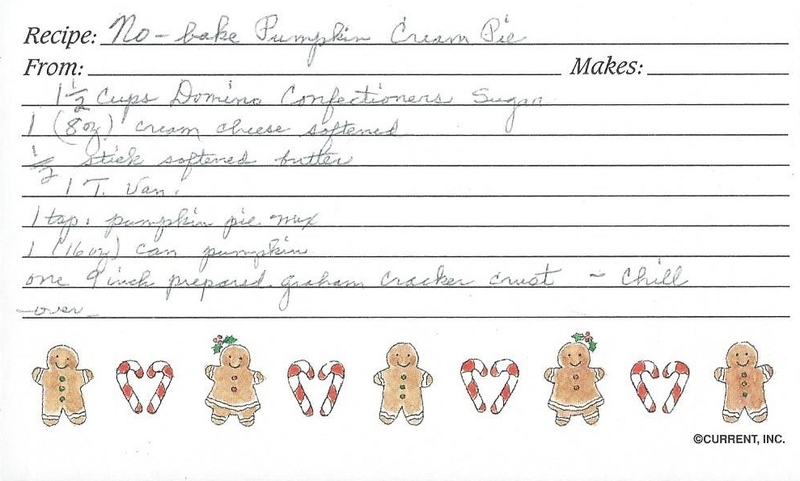 I have to say, we did make Pumpkin Pancakes a few years ago and we made them so much that we had to take a break. Our daughters come for dinner every Sunday and when I made these, everyone agreed that they’re absolutely delicious. Where have these been and why haven’t we had these for so long? They were the ones who told me that we needed to take a break! Well, our break-up with the pumpkin pancakes is over. We’re back together. For good! 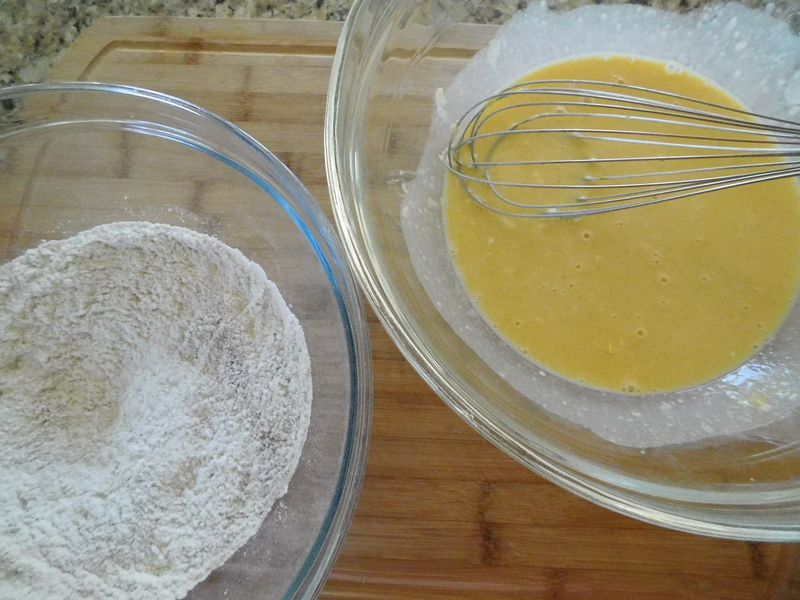 Pour in about 1/4 cup of batter per pancake. Cook 3 minutes per side. 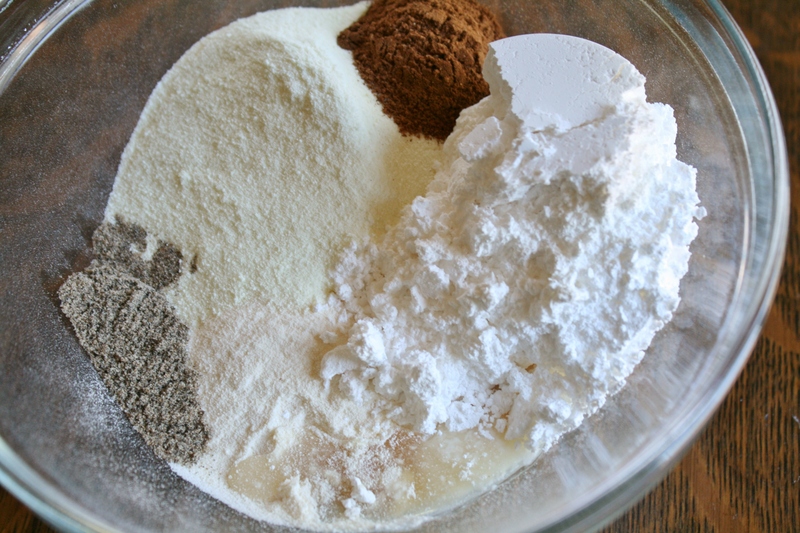 Mix the wet and dry ingredients in separate bowls. Fold them together and you’re ready to fry the pancakes. 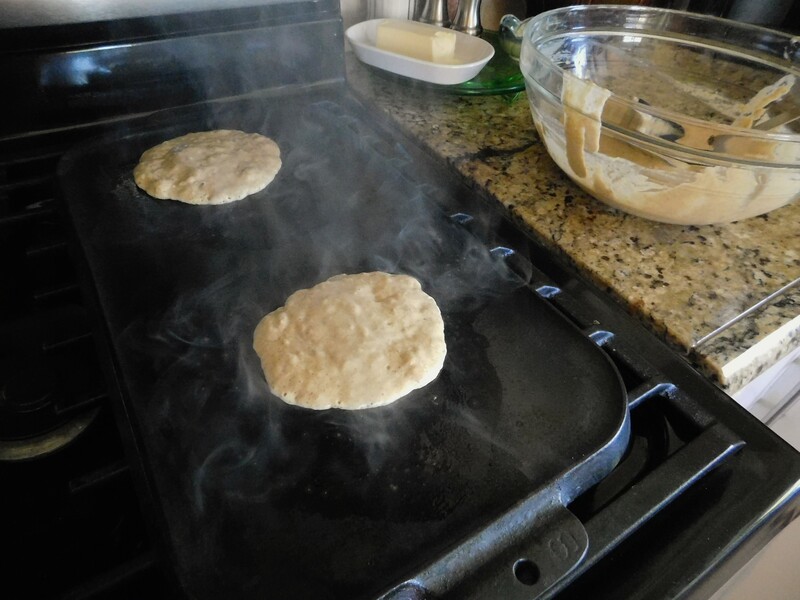 I used the griddle that has been in our family for years. 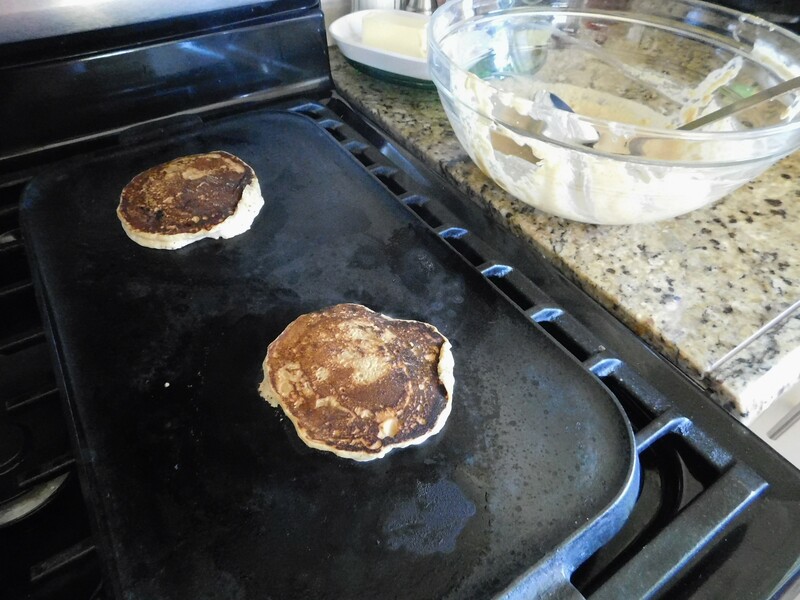 A little butter on the griddle (no – it’s NOT smoking, just steaming) and then put on the pancake batter. 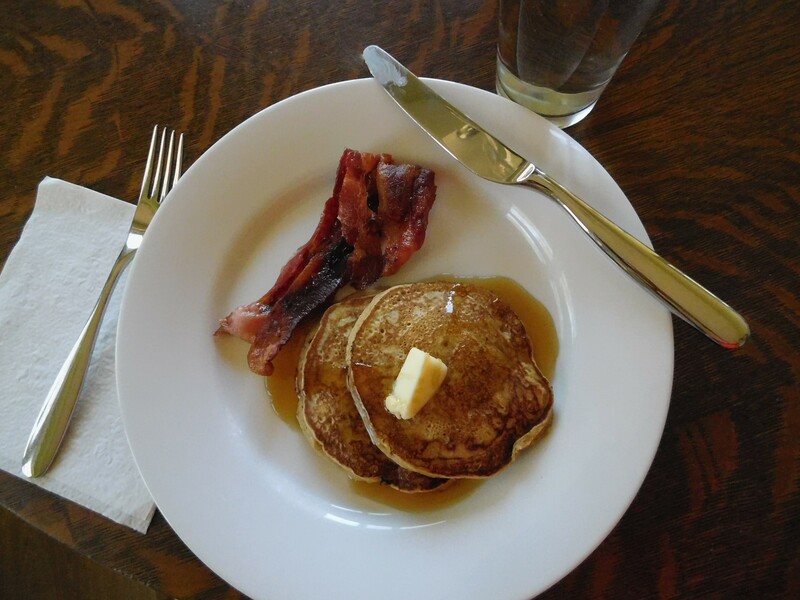 The best thing to serve with pumpkin pancakes – bacon. It’s necessary, really. A pat of butter on top and then for the real maple syrup. 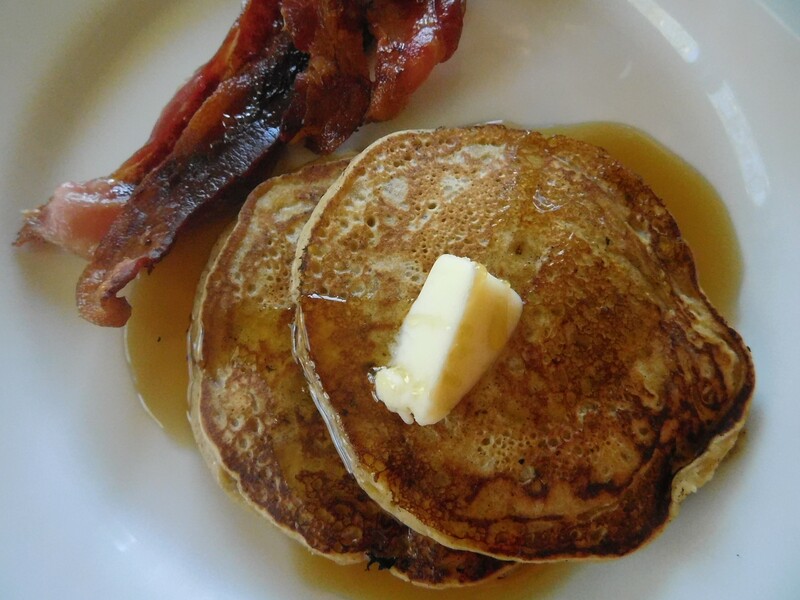 These pancakes are so good, you just have to make them part of your next breakfast or brunch. They’re easy to make and are amazingly tasty. Taking a break was hard. I’m so glad we’re getting back together with this old favorite. 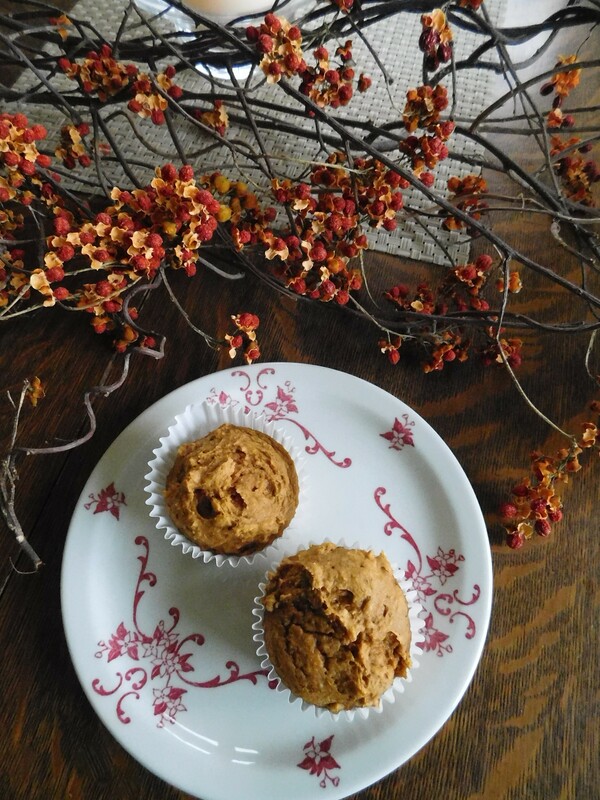 In keeping with my pumpkin theme (into November), today I’m sharing a recipe for 2 Ingredient Pumpkin Spice Muffins. Recipes like this are all over Pinterest these days (as I well know from my 2 week-on-the-couch-pinning-frenzy). This is THE EASIEST recipe ever – not even kidding!!! 2 ingredients, that’s it! 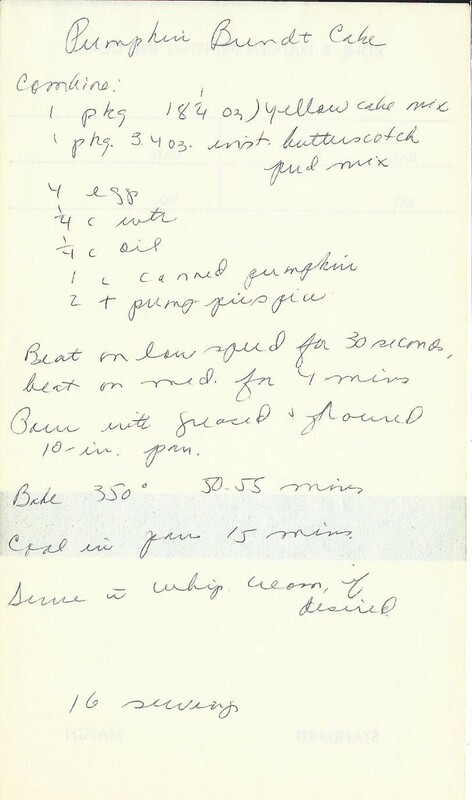 I love recipes like this, and I know Grandma would have, too – they’re so interesting. Who figures these things out? Someone with unlimited funds and an awful lot of time on their hands? Maybe it’s not really that hard to do. Who cares?! The point is – they’re delicious! 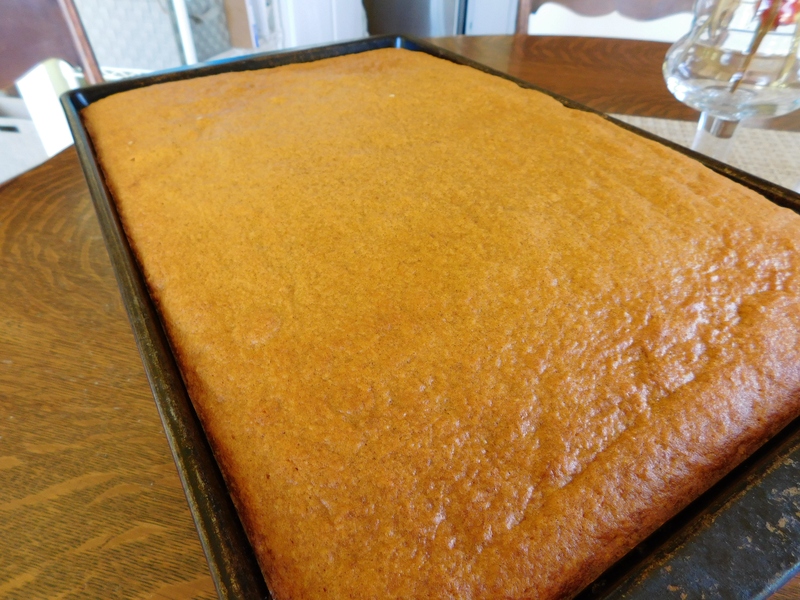 This particular recipe came from a member on Weight Watchers Connect (their Facebook type thing on the app), so it’s a bit healthier than most. 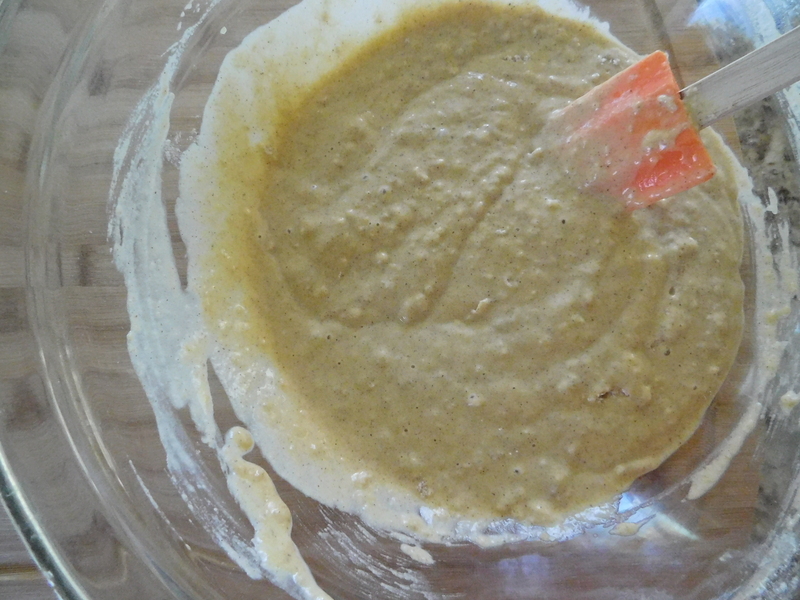 There is some sugar from the mix, but no fat because you use the pumpkin puree instead. Simple dimple. 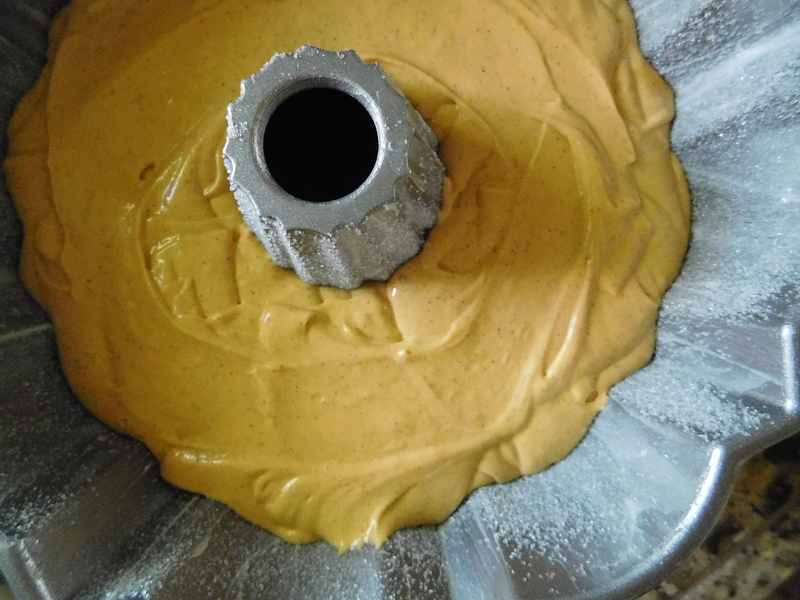 I mean seriously, you just mix the cake mix and the pumpkin puree – done. I’m sure you could add raisins or chopped apples or nuts to these, too. 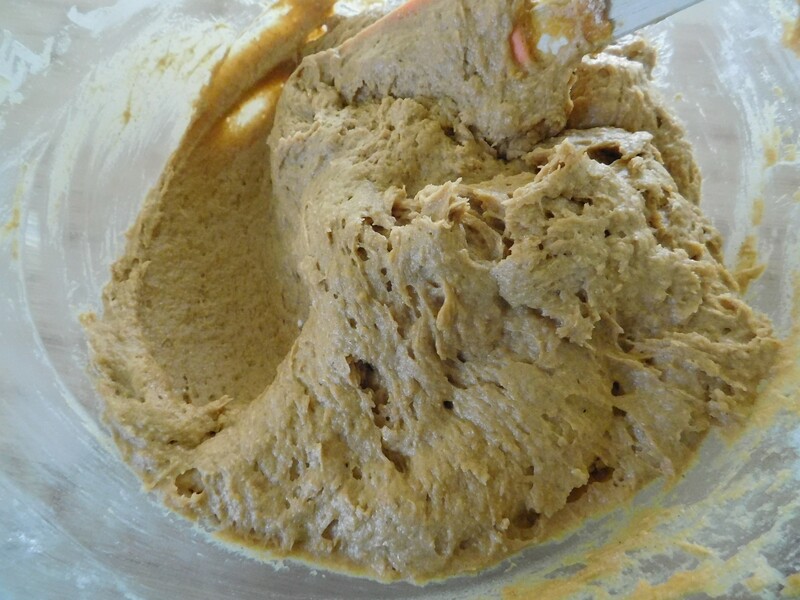 This makes a nice, thick batter. Into the liners and that’s it. I tried to get 24 muffins out of this, but I only got 22. Even though I want to be good and only have 1 at a time, when you make them this small, that’s really hard! 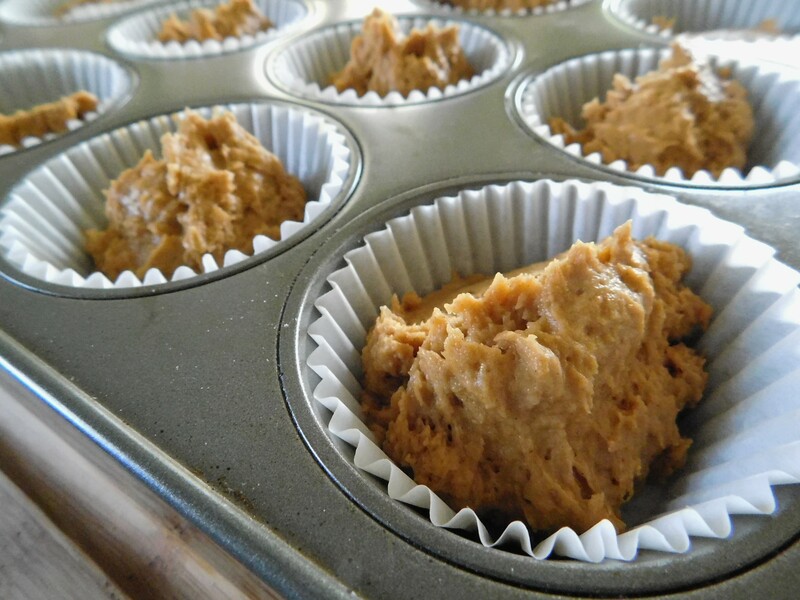 A little secret about these muffins – try to wait and eat them the next day. They come out of the liners better and the flavor is better. These little hummers are delicious. 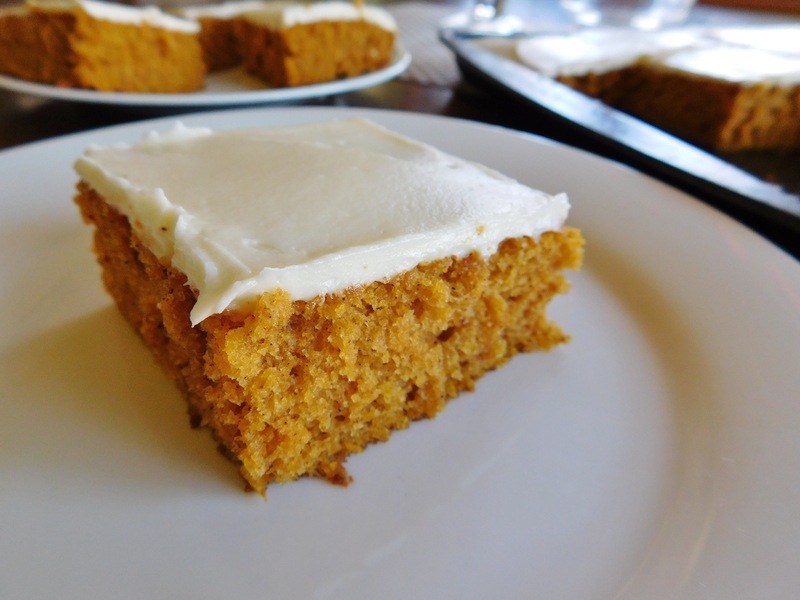 They’re spicy and pumpkin-y and so, so good! I just can’t believe how ridiculous these are: ridiculously easy, ridiculously good, ridiculously perfect for this time of year! They’re perfect for breakfast or an afternoon snack. Make up a batch today – no, wait – make a double batch because they’re going to go fast and you’re just going to have to make more anyway. I love Halloween. I always have. I love the old-fashioned black and orange decorations of flying witches, scary pumpkins, and jointed limbed skeletons. I love the costumes, as Lucy says in It’s The Great Pumpkin, Charlie Brown, “in direct contrast to her own personality” to dress up in and hide behind. I love the crispy sound of dry, colored leaves blowing and tumbling along the street. I love the eventual stark and empty tree branches silhouetted against a cloudy and misty sky. I love the fields full of haphazard pumpkins and gourds on their drying, twisting vines. I love the smell of a burning pile of leaves raked up and out of the yard by the family on the golden afternoons in October. I love the kids as they ring the doorbell, so proud to show off their costumes and shout the customary “trick-or-treat!”, running through the neighborhood and ruling the world. 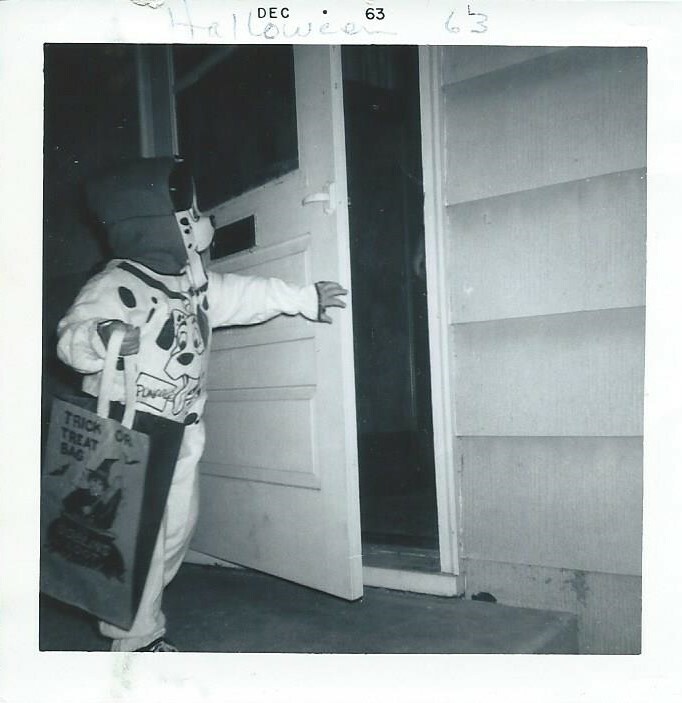 You can see the beginnings of my love for Halloween in this photo from 1963. I started young. I wasn’t quite 2 years old, but totally ready for Halloween and trick or treating at my Grandma and Gramp’s house! By the reach of that hand trying to get the door open, you’d almost think I knew that there was candy inside there! Ha! I wish I still had the 101 Dalmatians costume!! That trick-or-treat bag is almost as big as me! My love of Halloween is equal to my love of pumpkin. 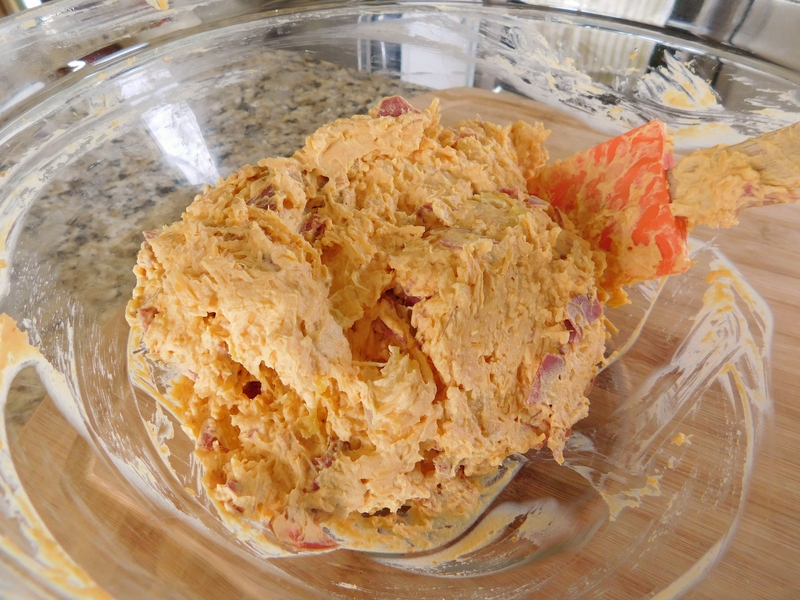 The recipe for today is one of those pumpkin recipes that I found when I was sick and on the couch and spending way too much time on Pinterest. 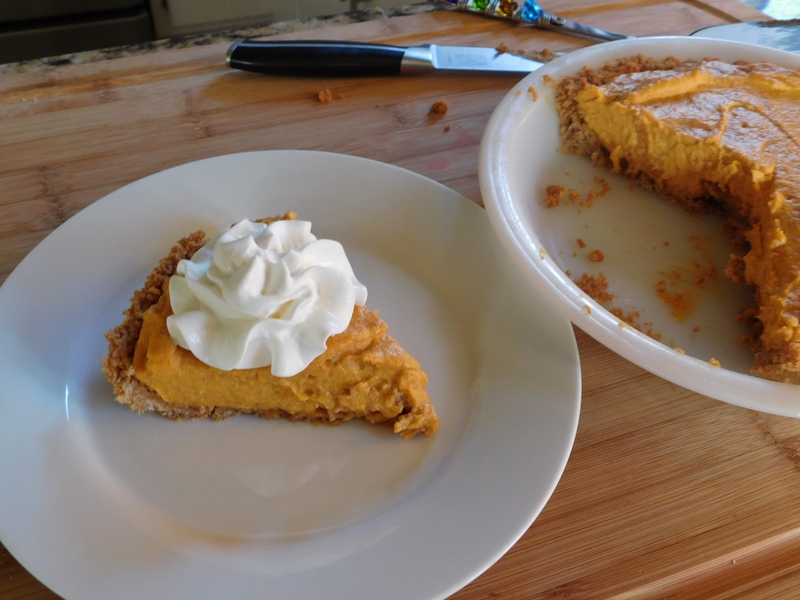 There are so many interesting things to make with pumpkin out there now, and as you can tell by my latest posts, I am determined to try as many as possible this fall. I am always on the lookout for a warm beverage to cozy up with and enjoy in the evening, so I don’t like it to be caffeinated and I don’t like it to have too much sugar in it. This one does the trick. 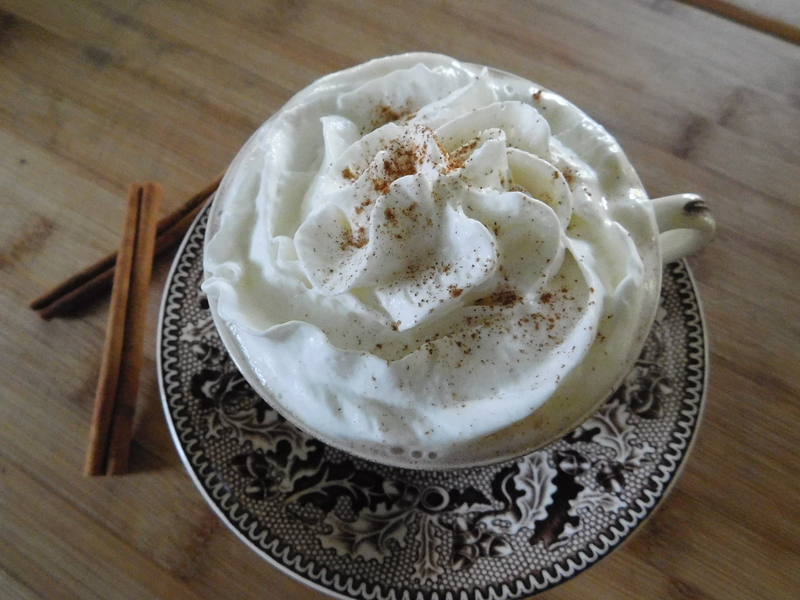 I found this delicious Warm Pumpkin Spice Drink on the blog Apple of My Eye, and this was one I had to try. This drink really doesn’t have very many ingredients, but man is this good! I warmed it (I wouldn’t bring it to a boil) on the stove instead of the microwave. You can leave it plain, but I’m always one to gild the lily when I can, so I topped mine with whipped cream and a sprinkle of cinnamon. I suppose if you really wanted to, you could add a splash of your favorite adult beverage to this. Kids would love this drink, especially this weekend before Halloween. Maybe this would be nice after a tough evening of trick-or-treating. I think adults would like this delicious drink curled up in front a roaring fire, in your jammies, wrapped in your favorite quilt. Just enjoy the warm deliciousness and drift off to sleepy land. Nothing more cozy than that! How are you going to enjoy this warm cup of coziness? It’s October and we’re heavy into fall right now. This is the time for pumpkin everything. 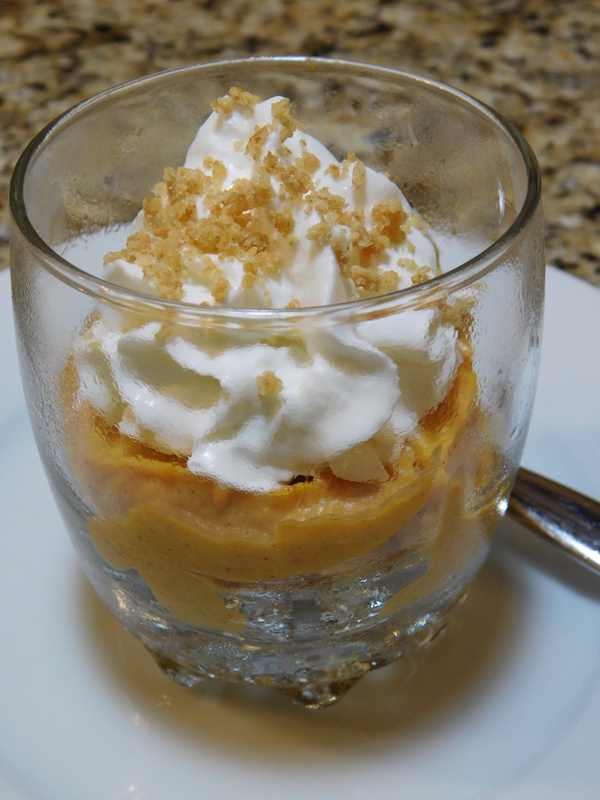 I was perusing Pinterest a few weeks ago when I was under the weather, and I found a lot of interesting pumpkin recipes. I felt like trying a few, and this was one of them. 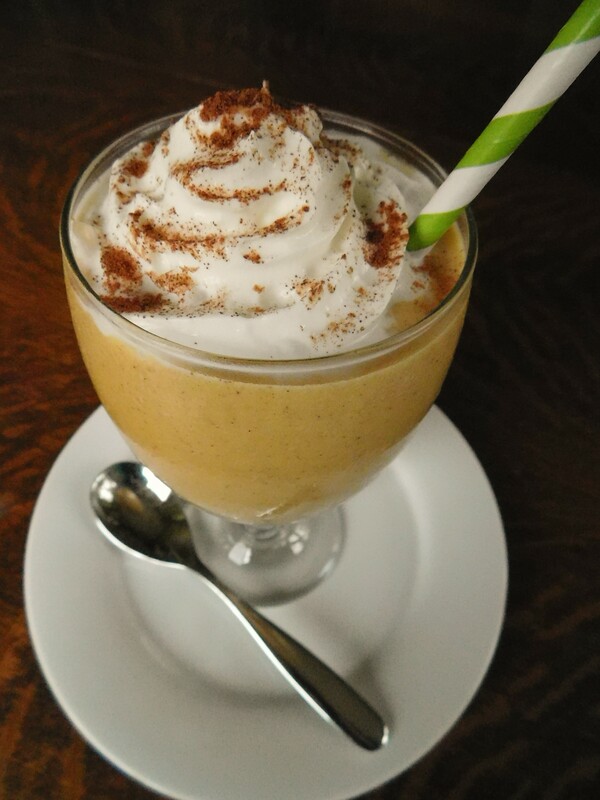 This recipe for a Pumpkin Pie Smoothie was on a blog called Shugary Sweets and you can find the original here. It’s a pretty healthy treat and a great snack. 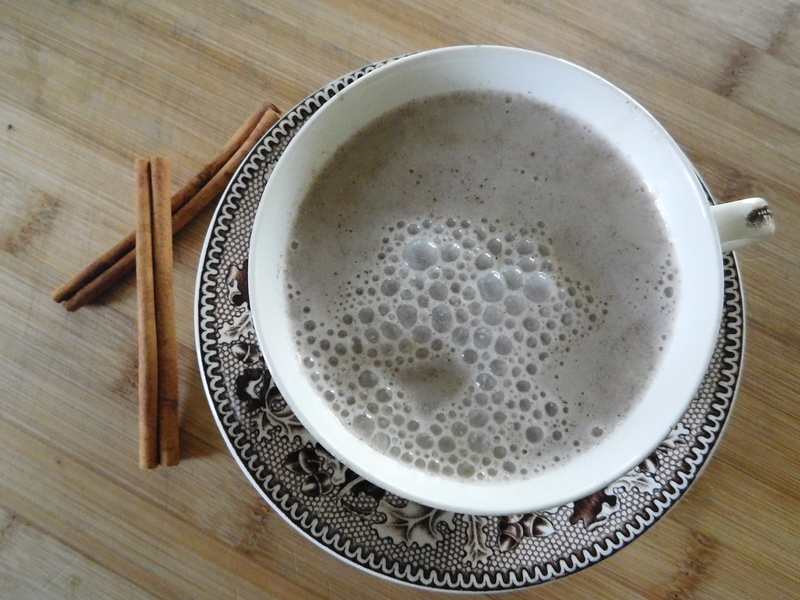 You could even have it for breakfast and add some protein powder if you like (as suggested by the blog where I found this recipe). Let’s give it a try. 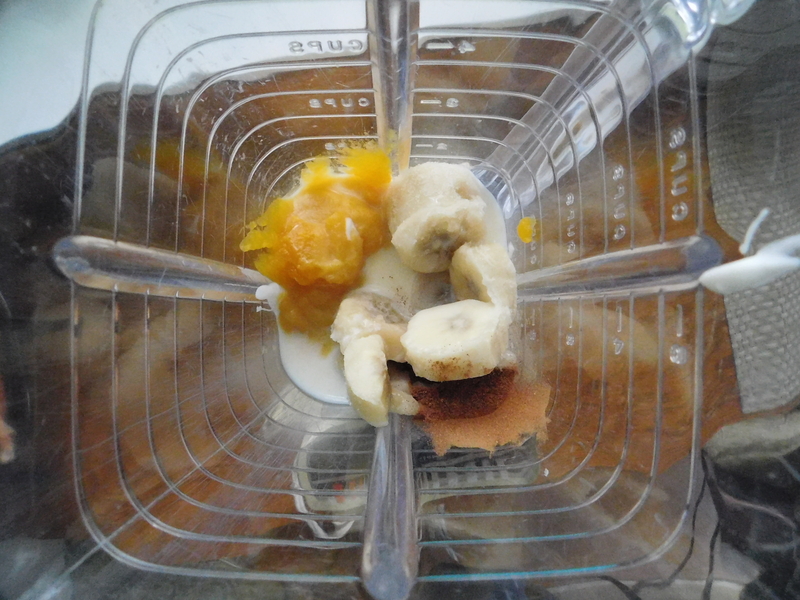 Put all ingredients into the blender and blend. 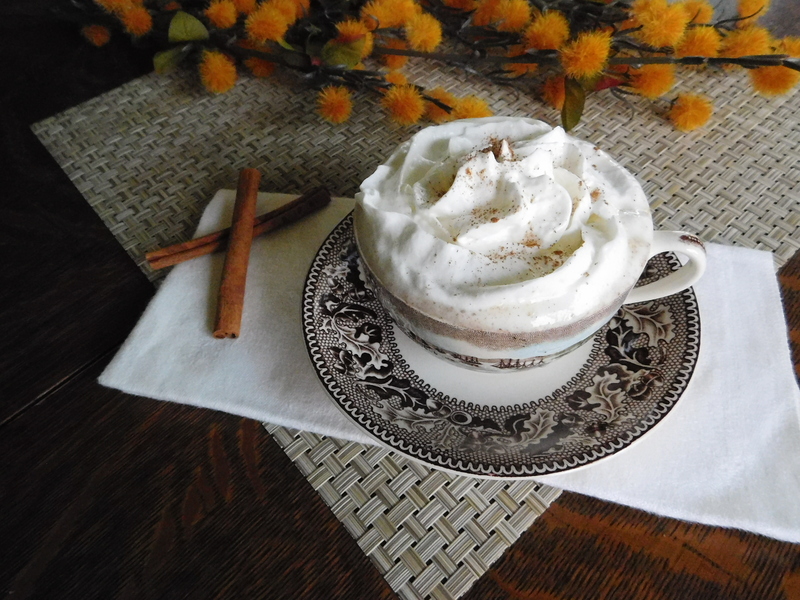 Top with whipped topping and sprinkle of cinnamon or nutmeg. There aren’t a lot of ingredients in this smoothie, but it sure is tasty. It all goes into my good old 35 year old blender . . .
and give it a whiz! Oh wow. This smoothie is so pretty, so good, and so good for you! 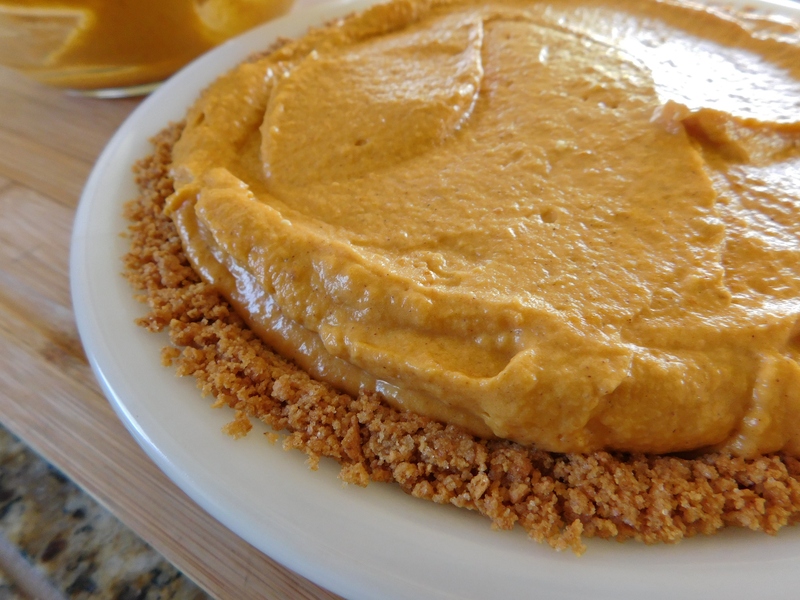 Whip up one of these today and take it outside to enjoy the fall, all of those short-lived colored leaves, and the taste of pumpkin pie! After the 6th day of the worst head cold known to man, making a permanent indentation on my couch, and pinning an incredible number of great ideas on Pinterest, I was going stir-crazy and it was time to get off the couch and make something. If that something happens to be good for me and is a great accompaniment to my daily gallon of tea or other warm beverage for my throat, all the better. Have you noticed that people are obsessed with the pumpkin spice thing? I decided to try a recipe of my own. Well, using one that I already have, of course. A very good one. 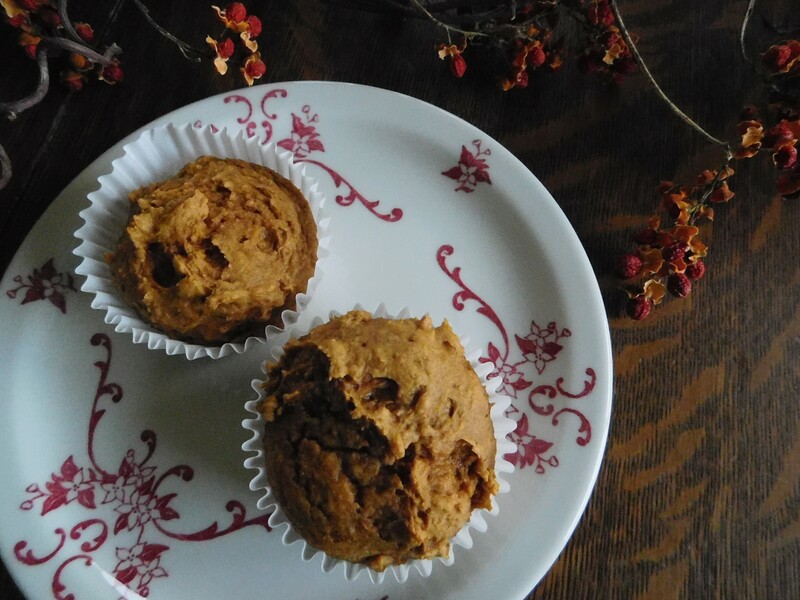 I reinvented the Oatmeal Muffin recipe of Grandma’s (one of my all-time favorites) using some of the huge stash of frozen pumpkin puree that I still have in my freezer. 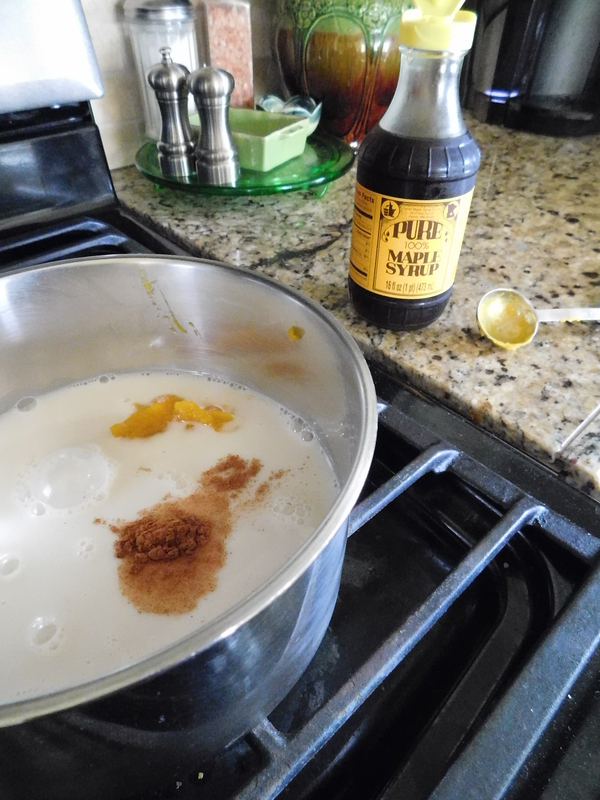 I just added pumpkin instead of butter in the muffins, and added the obligatory pumpkin pie spice. 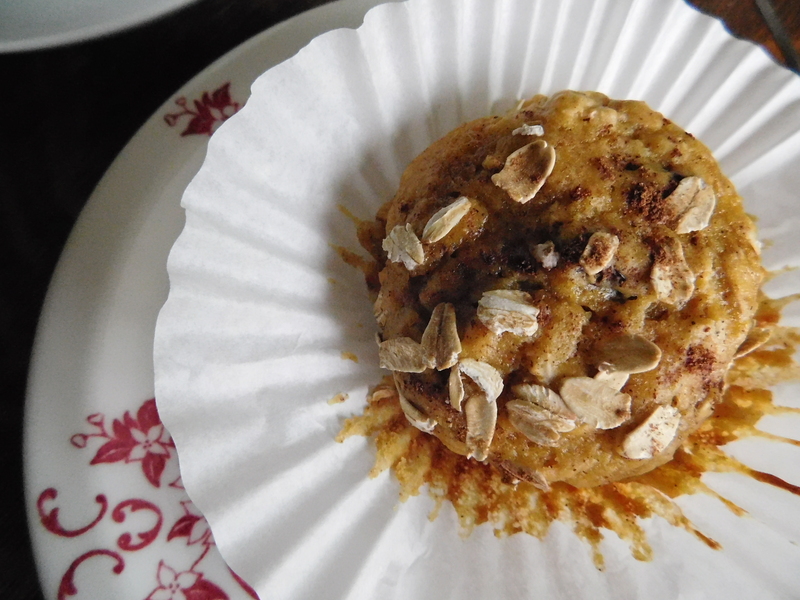 These Healthy Pumpkin Spice Oatmeal Muffins didn’t turn out too bad, if I do say so myself. Oh yeah, and I’m calling them healthy, sort of, because of the lack of butter. There’s still plenty of sugar and sour cream in these. That’s why they’re only sort of healthy. Combine oats and sour cream. 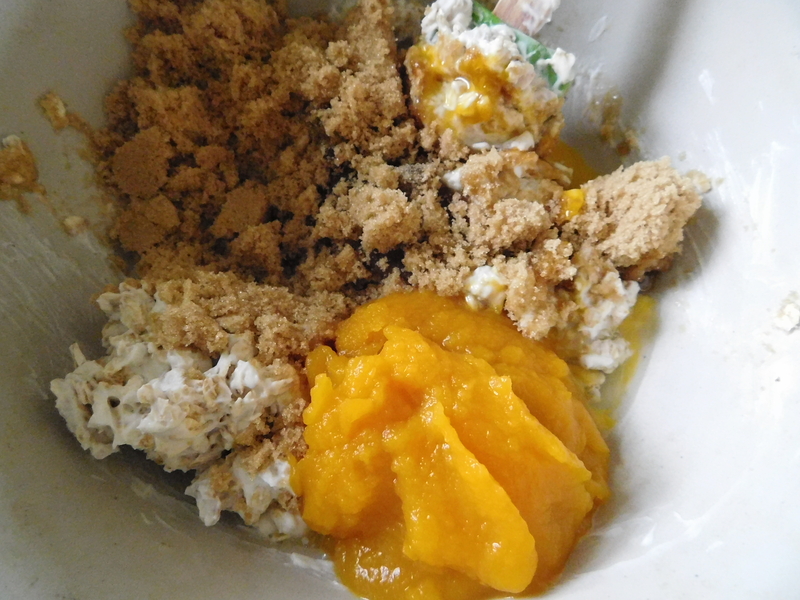 Stir in pumpkin, egg, and brown sugar until well mixed. 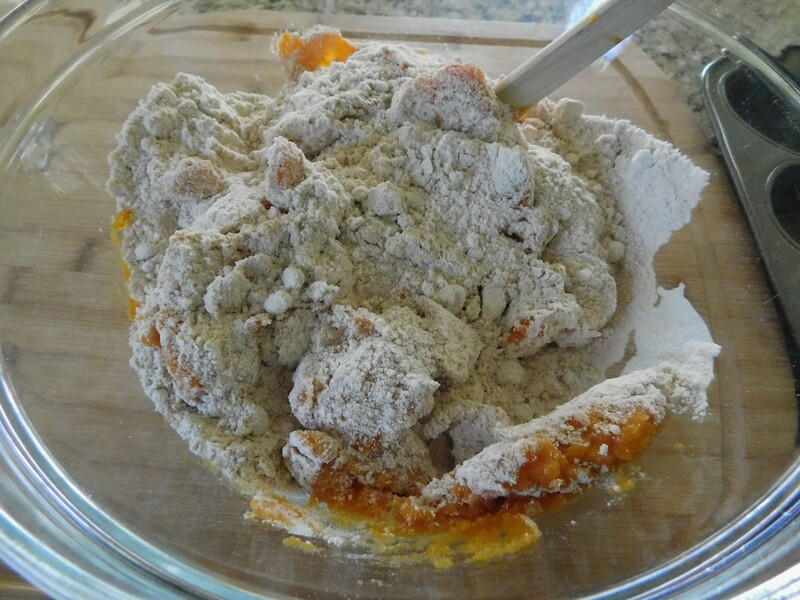 Sift together flour, baking powder, baking soda, salt, and pumpkin pie spice. Stir into oat mixture just until blended. 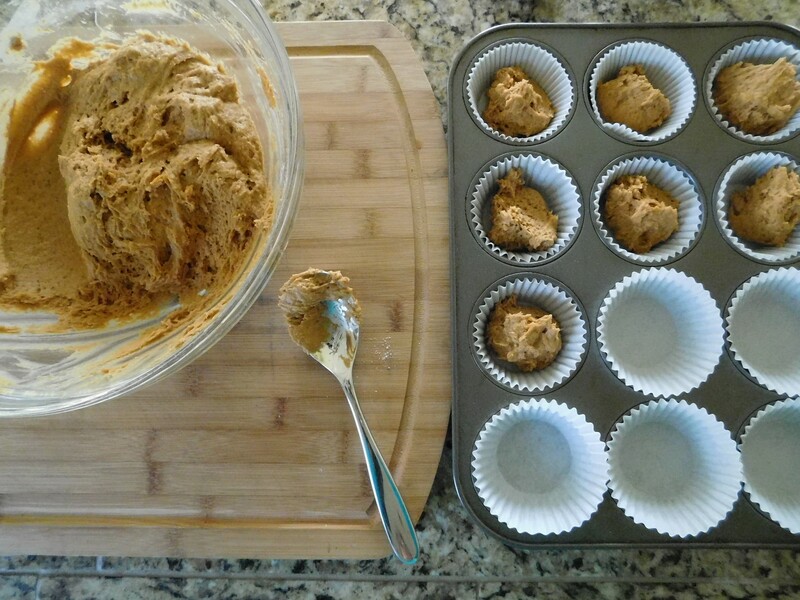 You can add 1/2 to 1 cup raisins to these – for a little added healthiness. 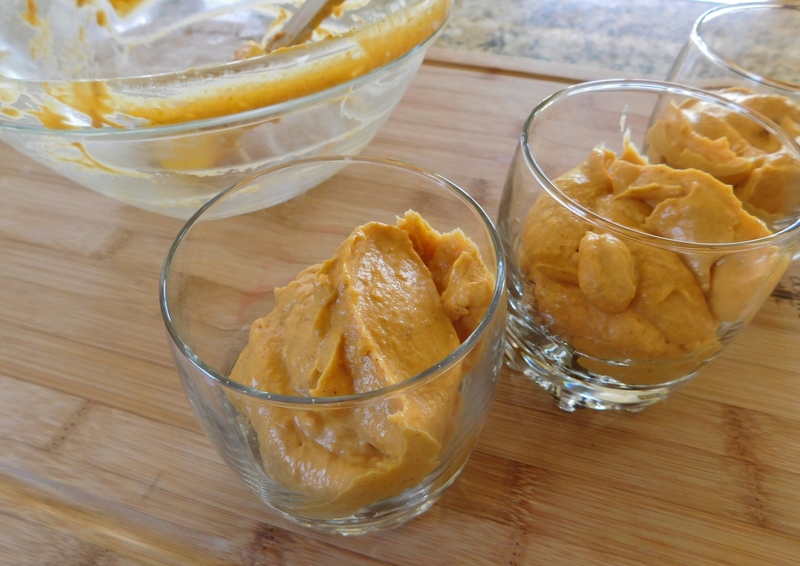 The pumpkin puree is a great substitute for butter. You really can’t tell the difference. 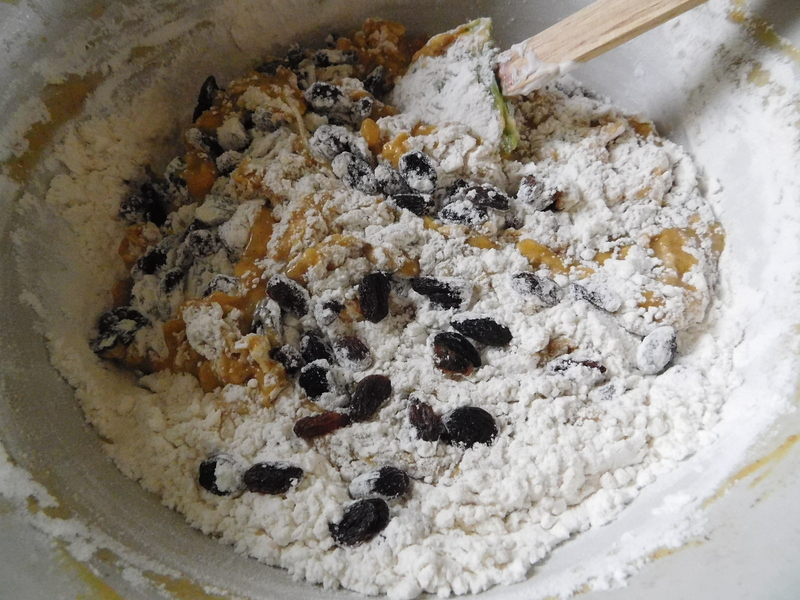 I like to add the raisins, but you don’t have to. I don’t know why I had these gigantic cupcake papers, but they worked just fine. When I filled them, I used a 1/4 cup measure. 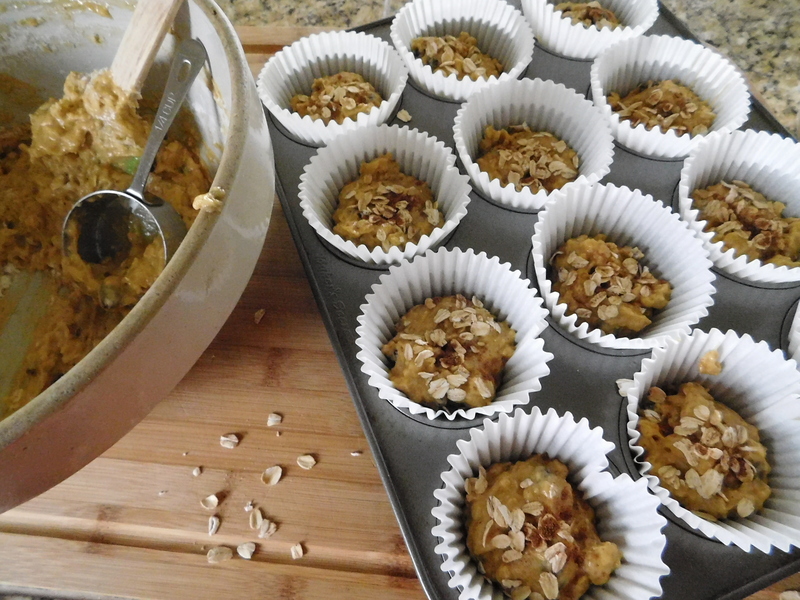 A sprinkle of oats on top and they’re ready for the oven. They’re delicious and smell amazing! You can see by the color that they’ve got pumpkin and spice in them. The oats add a little extra crunch on top. 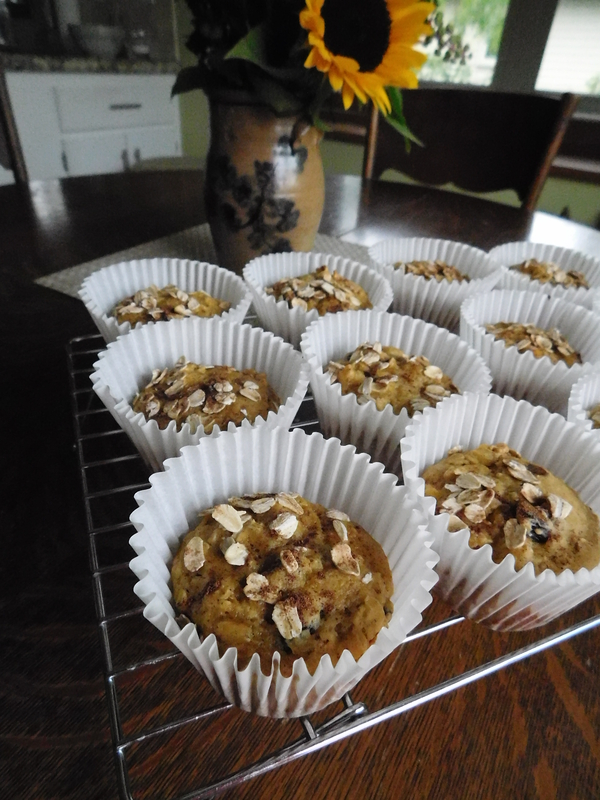 Yes – these muffins are really good and go well with tea or any other warm beverage you like. 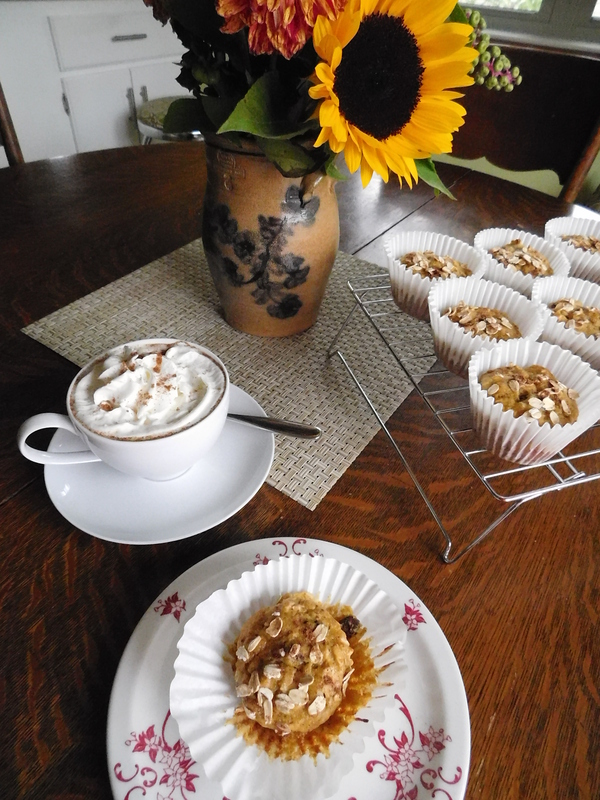 I have to say they turned out pretty well – they’re really good and really tasty. 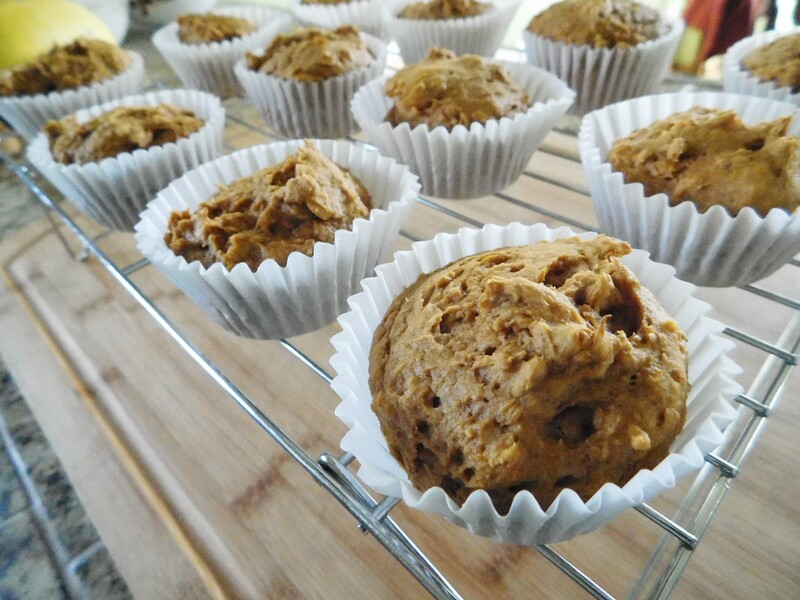 Make a batch of these and join in the pumpkin spice trend! I can’t believe it’s October. That means it’s time for colored leaves, apples, wool scarves, and pumpkins. Speaking of colored leaves, this is a photo of the colored leaves of New Hampshire from last October. My husband and I were on the way home from our trip to Massachusetts. I actually stuck the camera out of the sunroof of the car with occasional warm ups back inside. It was a cool, wet day in the mountains. We had the heat cranked in the car until my husband finally said, “how about enjoying the color without looking through the lens?” It was – and I don’t use this word lightly – AMAZING!!! The leaves were so colorful, they looked photo-shopped! I swear – I haven’t touched this photo! I know! It was unbelievable!! 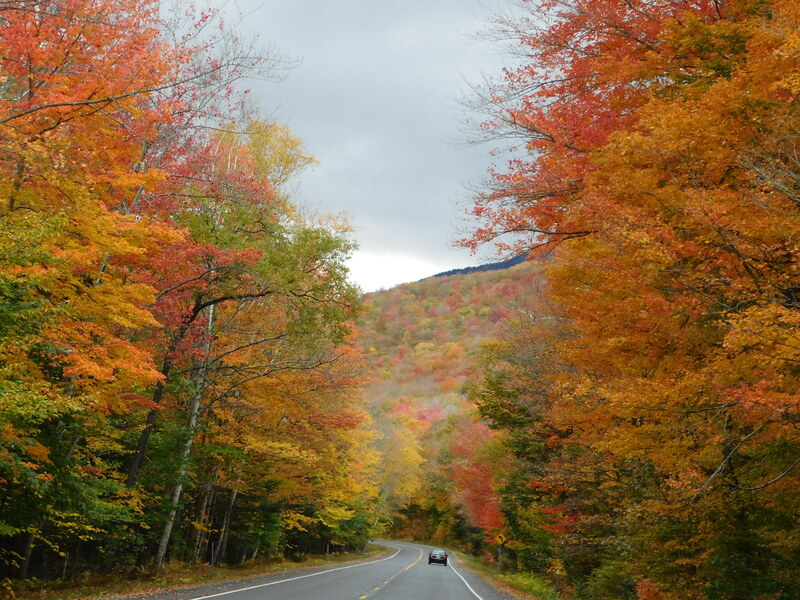 If seeing the fall color in New England isn’t on your Bucket List, it should be. I highly recommend it! Cooked or carved, pumpkins ARE October. 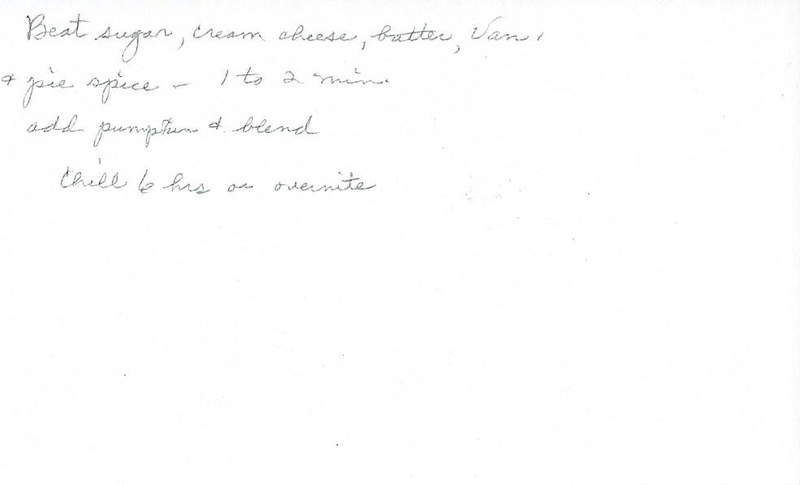 The recipe for today comes from my mom. She can’t remember where she got it, but man, I’m glad she got it. It’s a good one. 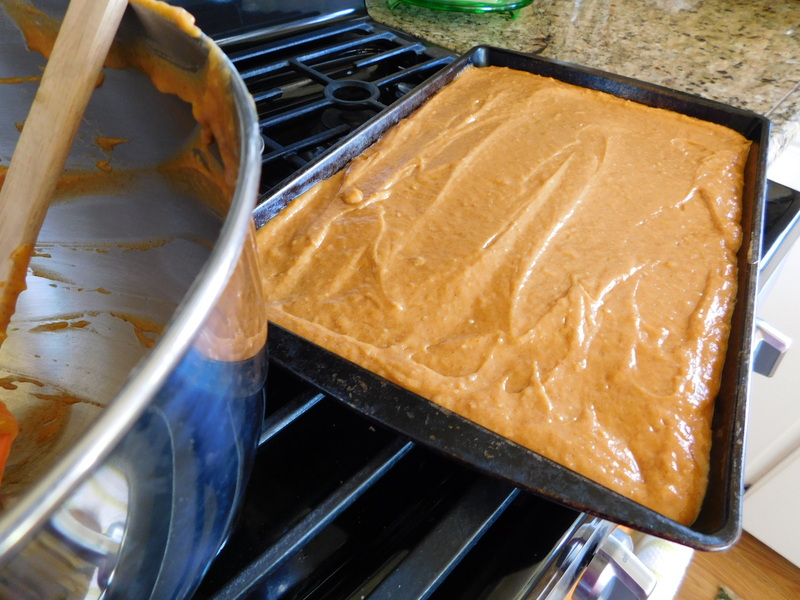 Oh my gosh – the smell of this cake baking in the oven – heaven! 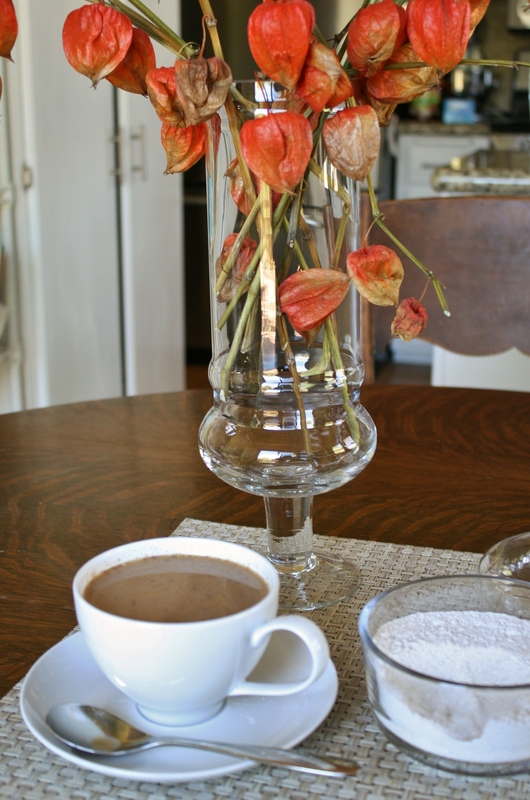 It made the perfect fall scent that totally filled the house – a great air-freshener. 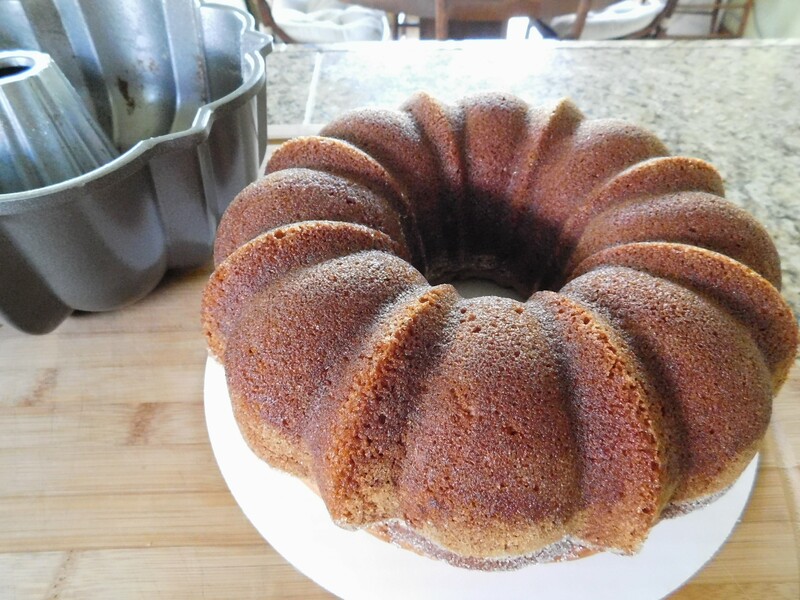 This Pumpkin Bundt Cake is ideal for this time of year and all of the special occasions coming up from September through November. 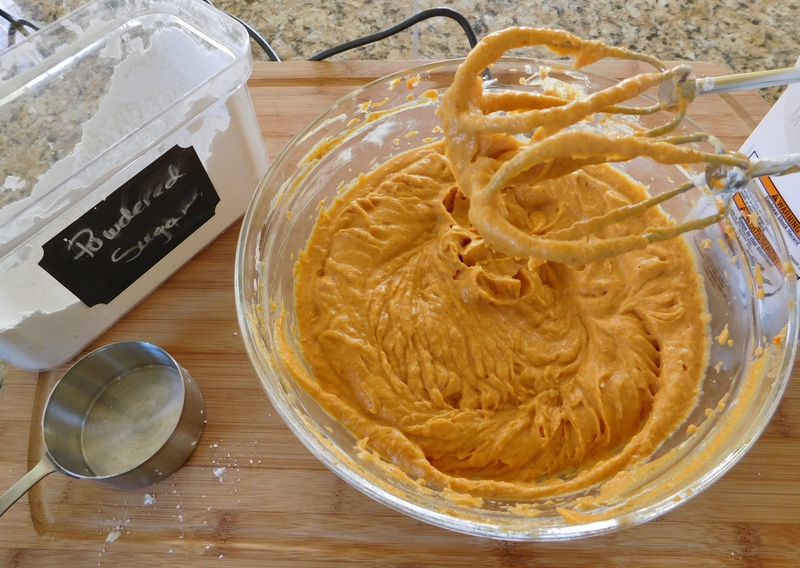 It’s very moist, is absolutely delicious, and smells so spicy and pumpkin-y and butterscotch-y. This is a very tasty cake. Beat on low speed for 30 seconds. Beat on medium speed for 4 minutes. 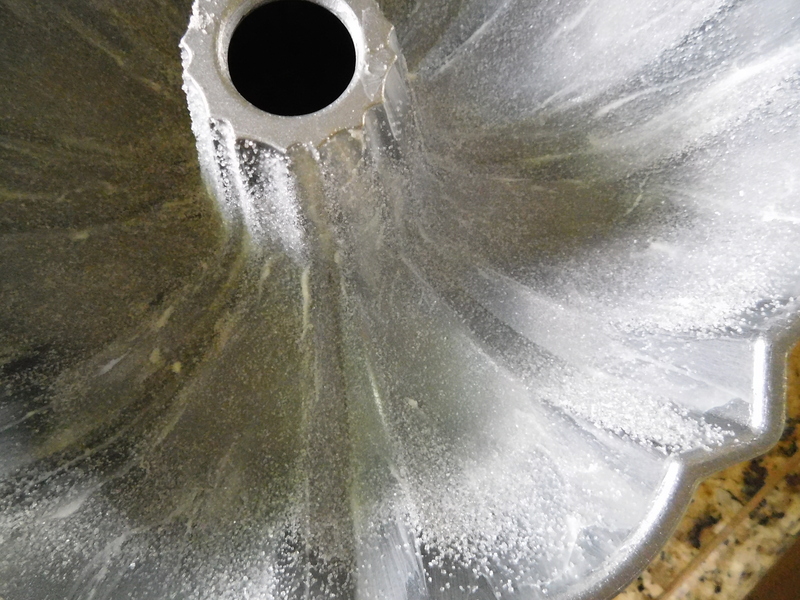 Pour into greased and floured bundt pan (I used butter and sugar instead of flour). I used butter to grease the pan and dusted it with sugar instead of flour. 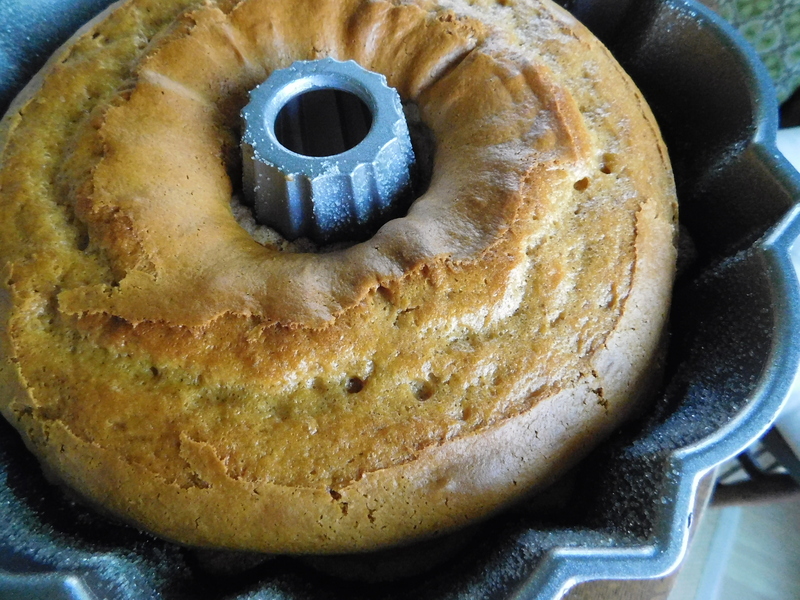 Bundt pans are just the best! They’re festive and pretty and so great for baking. Plus they’re made in Minnesota! Check out Nordic Ware here. 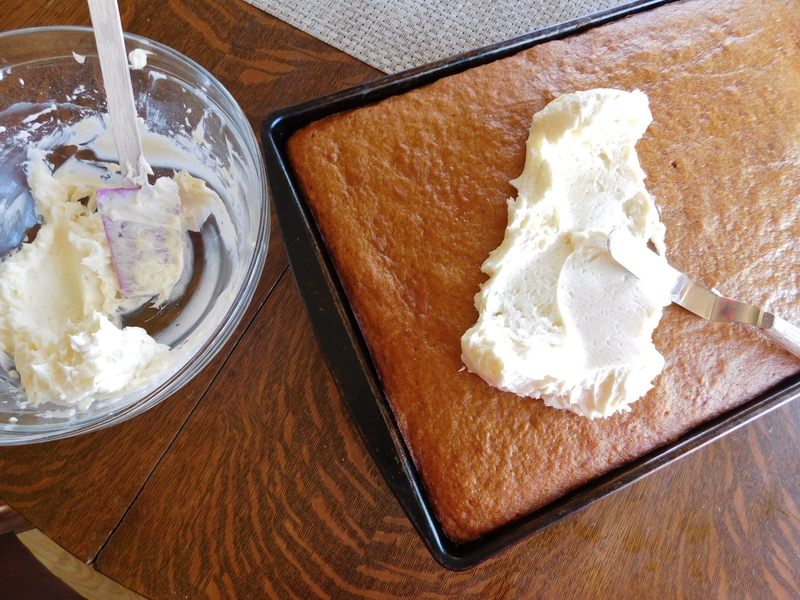 The cake came out perfectly with a nice light sugary crust on the outside from dusting it with the sugar! 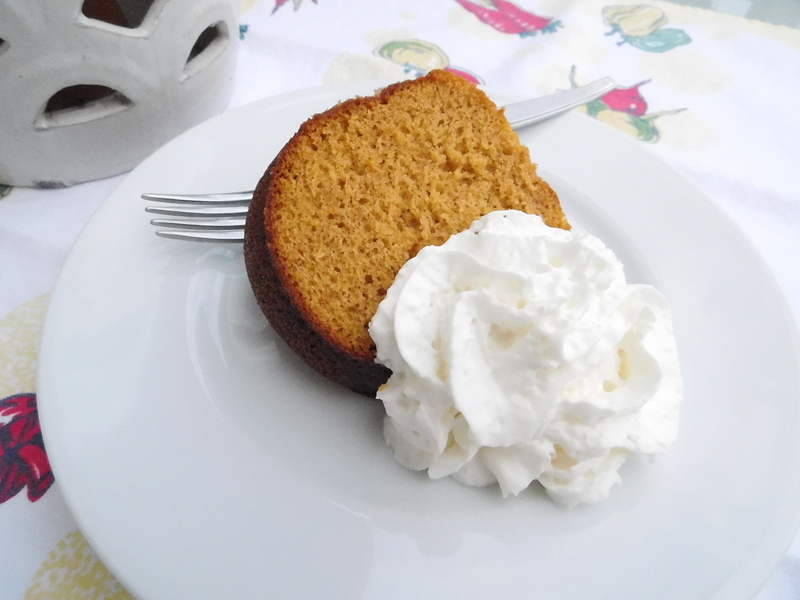 This is a perfect fall cake, especially with a bit of whipped cream. It would also be great with a drizzle of icing. Bake a couple of these and put one in the freezer for last-minute guests. Better yet, bake it when your guests come and take advantage of the built-in air-freshener! They may never leave. Today a northwest wind is howling through our trees, bringing cooler temperatures and a few snow flurries. The time has come for our beloved change of seasons here in Minnesota. I absolutely love the change and I don’t think I could ever live where there would be none. We’ve been spoiled with an amazing fall – beautiful blue skies and warmer than normal temperatures – but I’m pretty sure it’s over. The change from fall to winter is when we get to enjoy the fruits of our summer labor. It’s time to get cozy, sit by the fire, enjoy the upcoming holidays, and be with friends and family. I have made today’s recipe many times over the years. 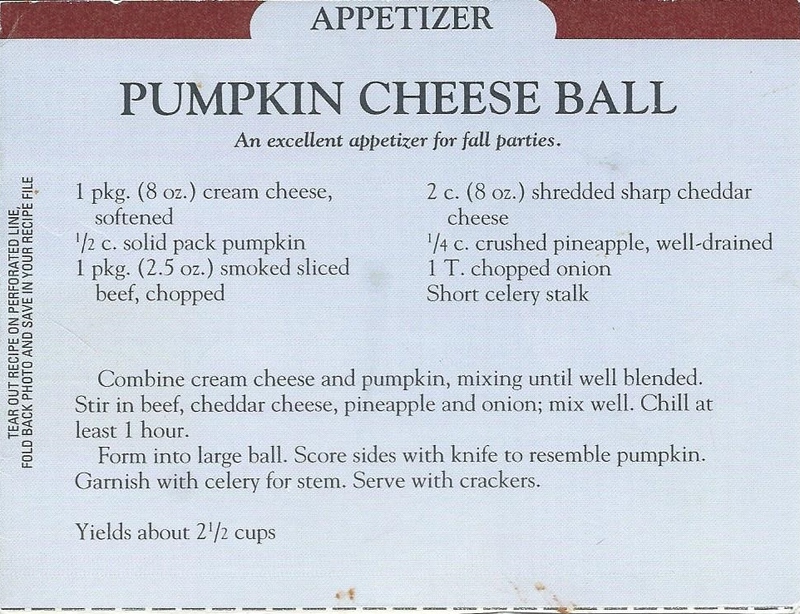 It’s a little bit different from the Cheese Ball that I’ve posted about in the past. 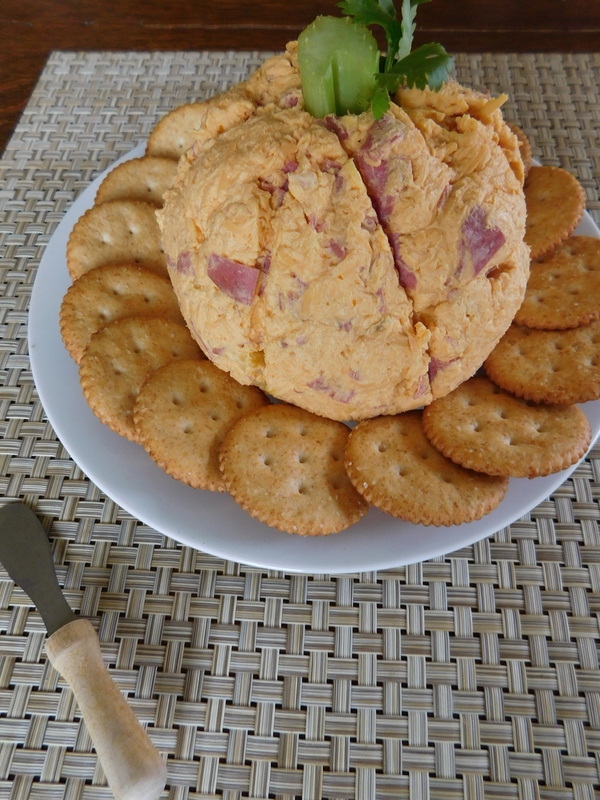 This Pumpkin Cheese Ball is really delicious. 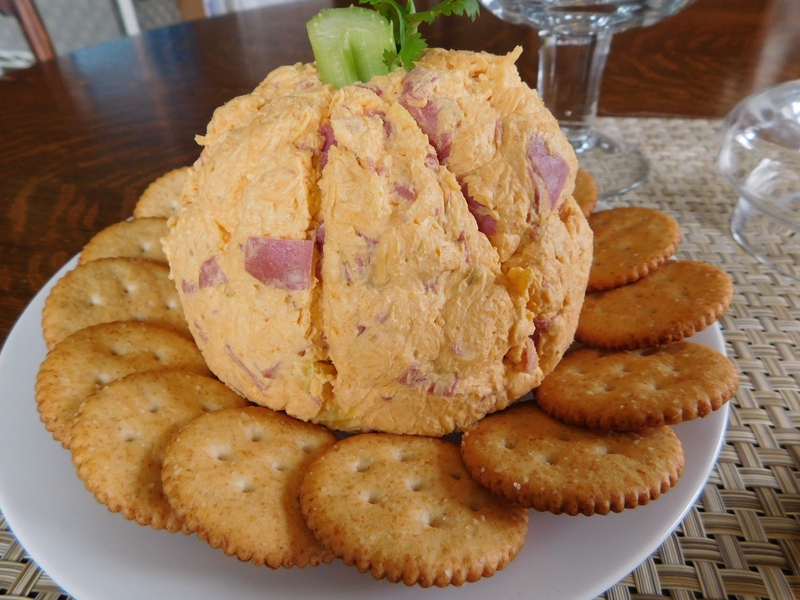 This is a great appetizer or snack for your thanksgiving gatherings! Score sides to resemble pumpkin. Cut a piece of celery for the stem. 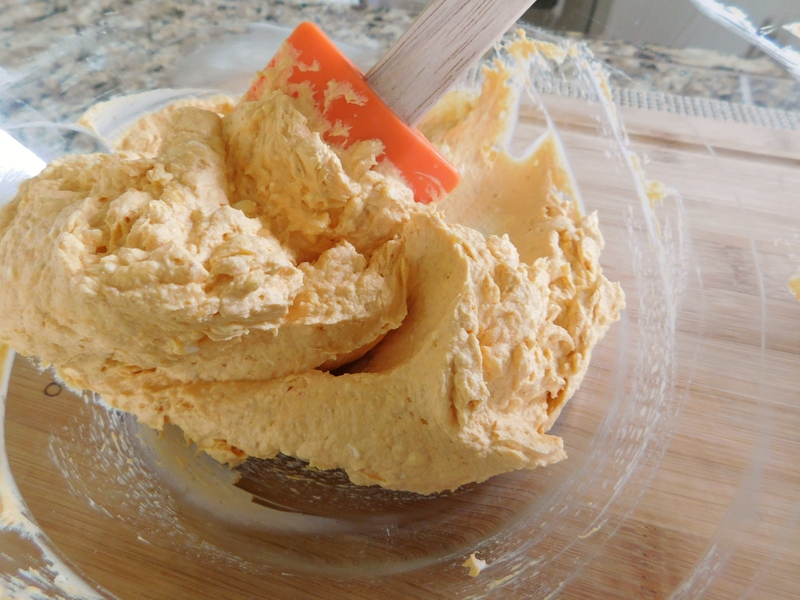 Don’t forget to soften the cream cheese when mixing it with the pumpkin or it will get lumpy. 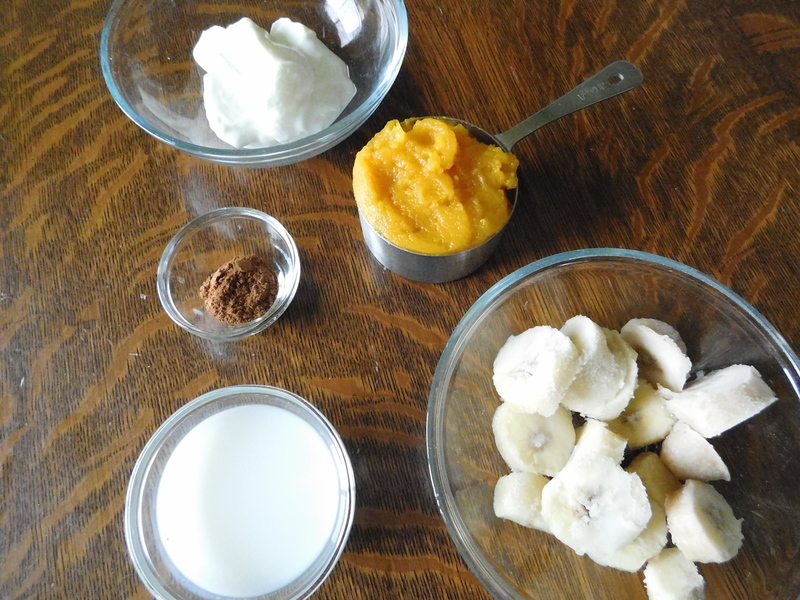 I love these ingredients – just a bit different. It’s got that beautiful pumpkin color, too! 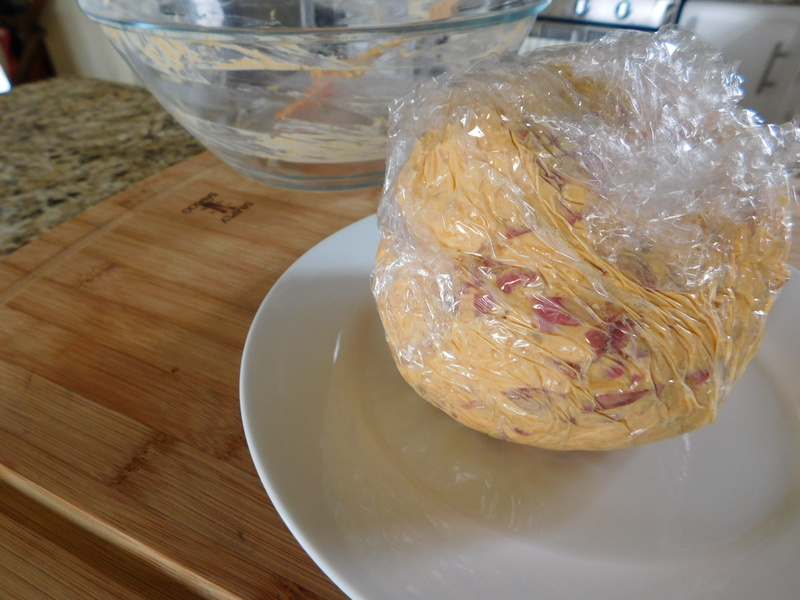 I like to put it onto a piece of plastic wrap, then make it a ball and put it into the frig to chill. It holds its shape better when chilled. I cut a piece of celery for the stem and used a piece of cilantro for a leaf (parsley would work for a leaf, too). Don’t forget to score the lines to make it look more like a pumpkin. Serve this with crackers or a sliced baguette. It’s delicious, and great to have made up and ready to have any time over the holiday weekend. Make one, then sit back and enjoy the fruits of your labor! This recipe is absolutely phenomenal. It’s another one that I’ve had for years and years. 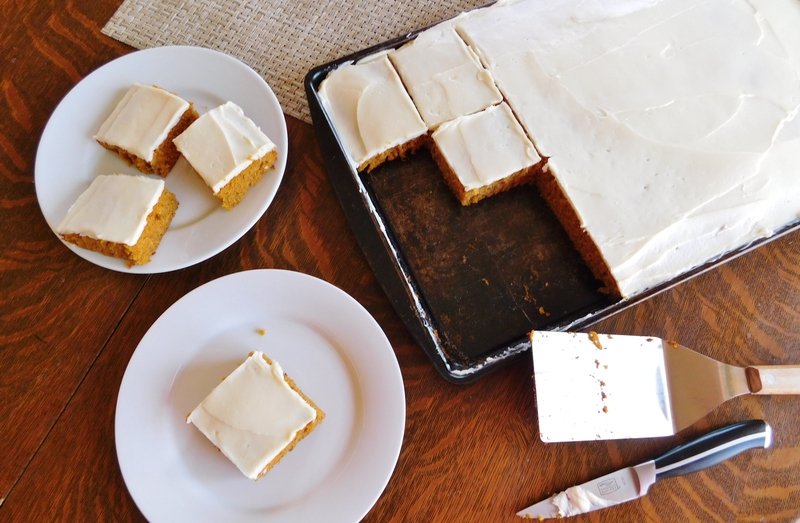 I have no idea where it came from because I have it just written down in my recipe book, but it’s makes the BEST Pumpkin Bars I’ve ever had. I wouldn’t be surprised if it originally came from Grandma. When we’d go to Grandma and Grandpa’s house this time of year, we never had dinner without lighting a candle in the middle of the dining room table, and I was thrilled when I was the lucky one who got to light it. I always thought that it was just a thing that Grandma did, you know, one of her special entertaining traits – lighting candles. After the trip I took to Sweden and Norway with my mom, sister, and godmother two years ago, I think now that it may be a cultural thing. Everywhere we went in Sweden and Norway, there were candles everywhere, and I mean EVERYWHERE! Not just on the dining tables, but all along the way TO the dining room, in the hotel lobbies, in the lounge areas, even in the front windows of the hotels. There were even candles so close to where you walked, I wondered if anyone ever knocked them over. It seemed like a fire hazard. But I liked it. I love candles, and this time of year especially. It’s like a light in the darkness of the long winter ahead. Of course, you have to be careful with candle flames and the matches used to light them. When I was little, I had a wonderful babysitter who taught me to always hold the blown out match under running water so it wouldn’t start the garbage on fire! I also love some of the new battery operated flameless candles they’ve come out with now – they’re so realistic. There’s a lot less worrying about the fire hazard thing. Regardless, I love candles and their warm glow against the long and seemingly never-ending winter darkness to come. Bake on a jelly roll pan (15″ x 10″) at 350 degrees for 25 minutes. 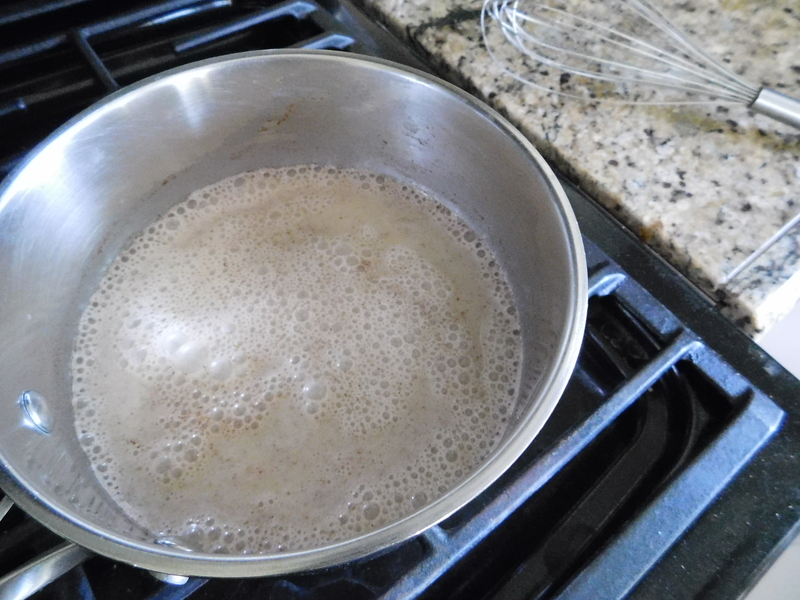 Add 1/2 to 1 cup powdered sugar (I used 1 cup) and beat until of spreading consistency. I don’t use my beat up old baking sheets for bars very often. The batter just fits! It rose just enough without overflowing! Is there anything better than cream cheese frosting? I think not. My family thinks these are more like a cake than bars. They think bars are meant to be picked up and held when eaten. I didn’t have a problem eating these with my hand, but they thought it was easier to eat with a fork. You have to try this recipe!!! I can’t stress that enough! It’s so good, so easy, so appropriate for this month! 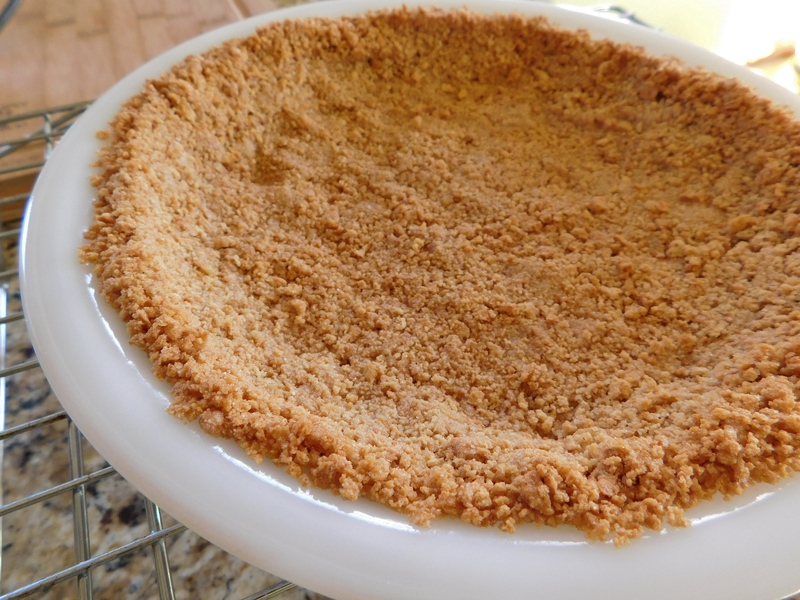 Add it to your Thanksgiving dessert table! It’s a keeper! 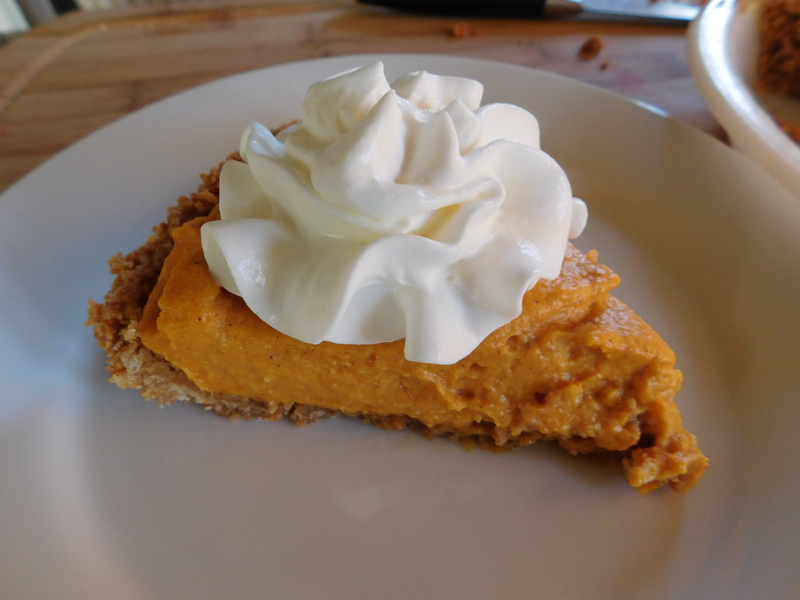 Recipes for Pumpkin Spice everything are all over the place this time of year, so I’m jumping in! 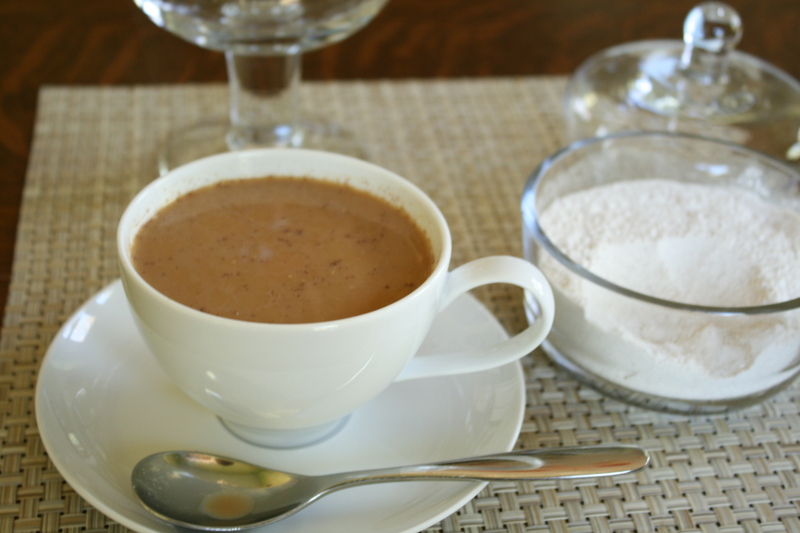 This Pumpkin Spice Creamer is just the ticket. Maybe it’s that the weather gets cooler and we’re looking for a nice, warm, tasty drink to warm us up. Maybe it’s that this time of year when the sun has that golden glow and goes down earlier, we’re looking for ways to be more cozy. Maybe it’s that we just love fall and spice and we’re willing to try to get it into every food or drink we can. I don’t know what it is about the pumpkin pie spice thing, but I’ll take it. It really is the flavor of fall. It’s delicious. 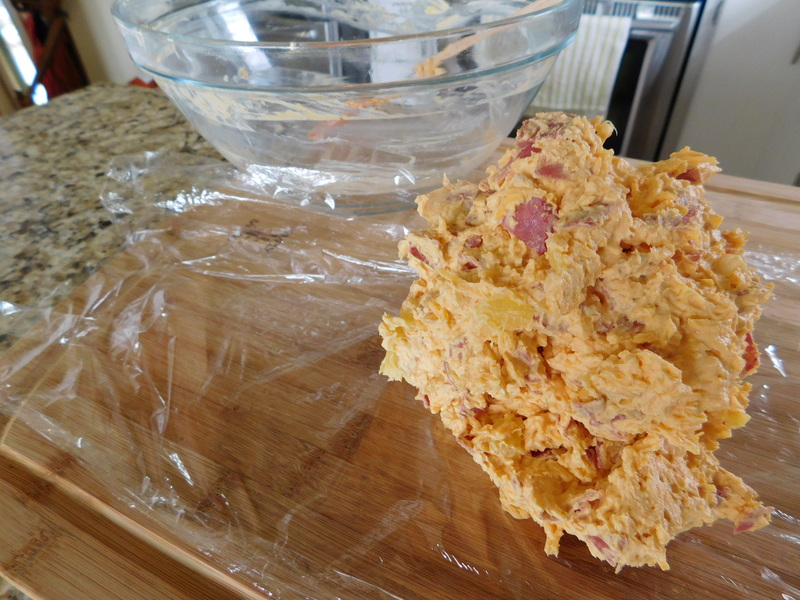 I’m sorry that I don’t remember where I found this recipe, but I did find it somewhere on the internet. 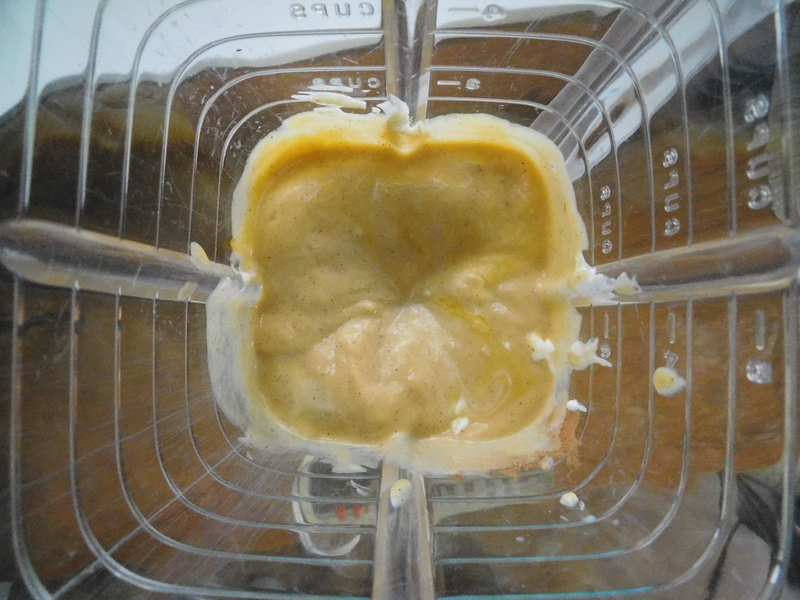 Mix together (I used a food processor to better mix in the vanilla) and store in airtight container. 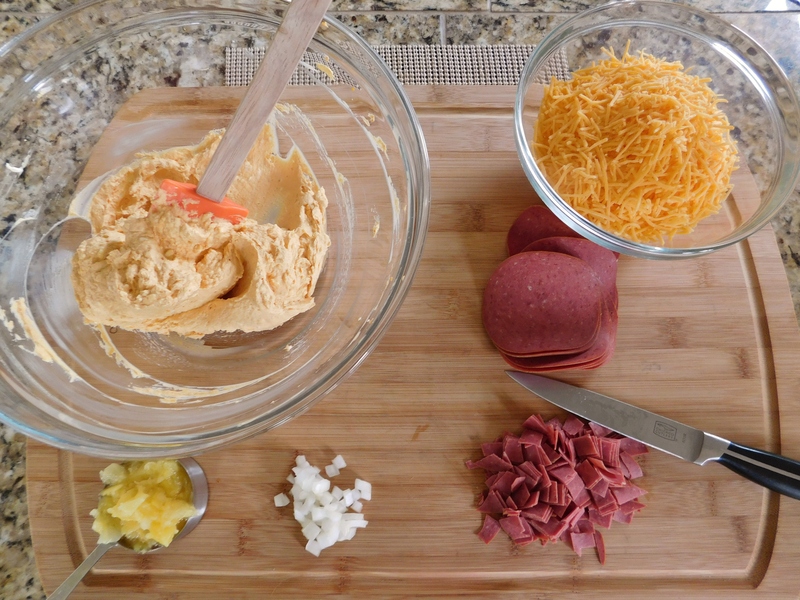 This recipe really has very few ingredients to make something so tasty. I don’t drink that much coffee and it makes a kind of big batch so I cut it in half. 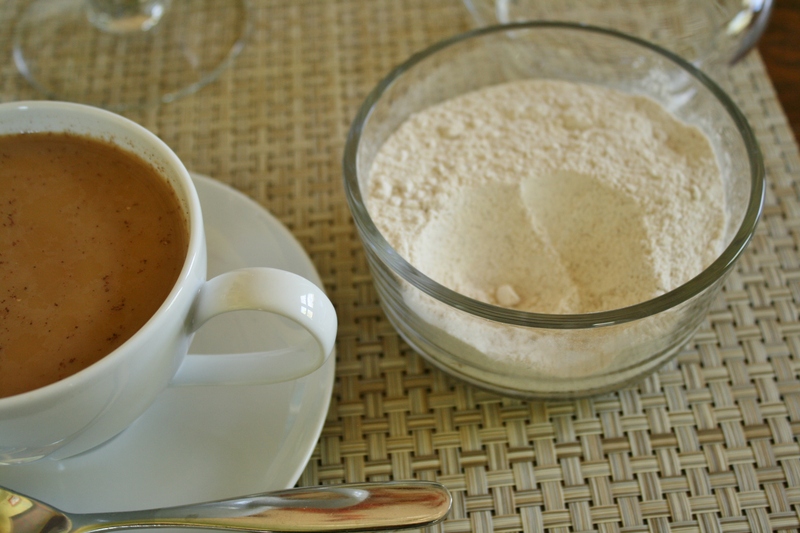 The creamer makes your coffee so spicy and creamy. 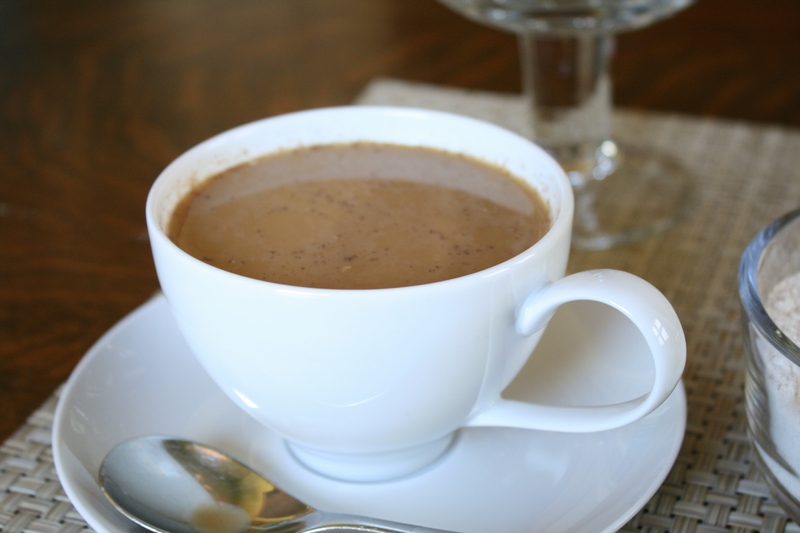 Your afternoon coffee will make you feel so cozy, you won’t believe it! It tastes like fall. Spicy, cozy, warm and just a little bit sweet. Just what we need this time of year!